The Radical Candor vocabulary can be very useful for creating shared context and a shared standard around feedback. However, there are some good ways and some not-so-good ways to use this vocabulary. 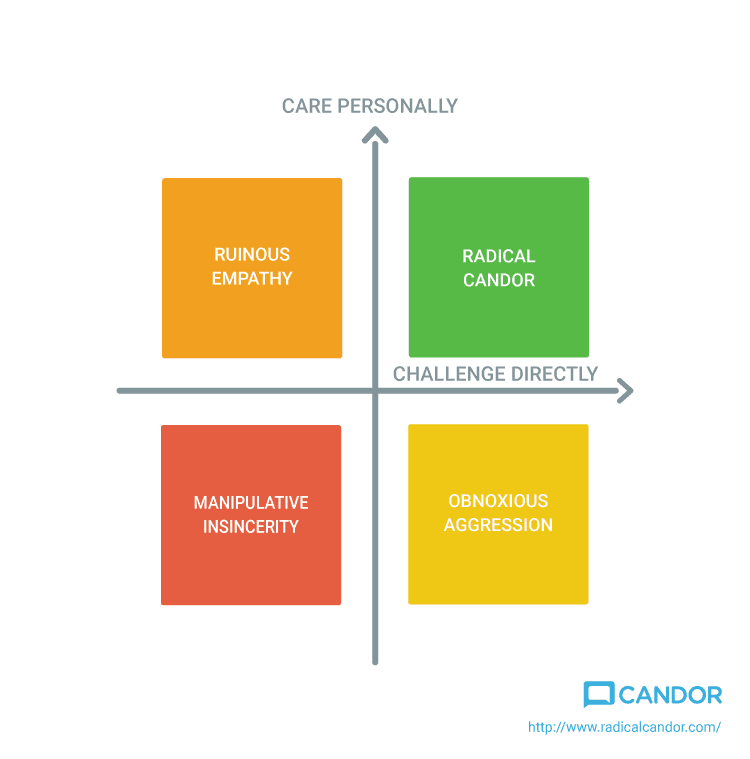 When used within a company, it can be tempting to label people using the 4 Radical Candor quadrants. “Oh, yeah, Obnoxious Aggression – that’s totally Ted!” Or people walking around making the letter “M” with their fingers to identify certain co-workers as Manipulatively Insincere (oh, that doesn’t happen in your office?). Let’s not do that! These words are meant to be used to evaluate and analyze certain interactions, and not used like Myers-Briggs or another personality test. 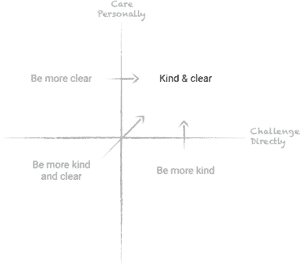 We all behave in different ways in different interactions, and most of us probably spend time in each of the four quadrants. We would like to encourage people that are trying to build a culture of Radical Candor not to use these terms as labels for people but to evaluate and analyze interactions. 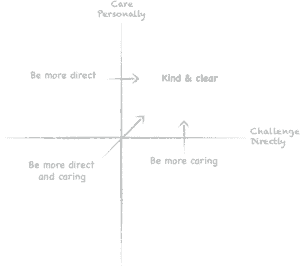 Here are some guidelines for getting the most out of the Radical Candor vocabulary in your organization and remembering not to label people. The quadrants are handy two-word phrases that are often memorable and relatable. Heck, they are even kind of fun. 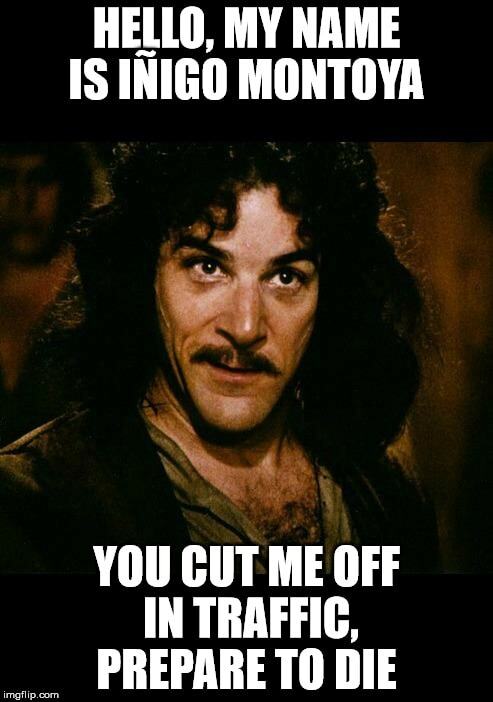 But they are meaningless without the axes. To analyze or evaluate an interaction, don’t focus so much on the words “Obnoxious” or “Manipulative”, but rather, evaluate an interaction based on whether there was a high Direct Challenge (CD) or whether there was high Care Personally (CP). This is important because it’s possible to act with Empathy in a certain interaction and still achieve Radical Candor (high CD, high CP). It is also possible to act Aggressively in an interaction and still show up Manipulatively Insincere (low CP, low CD) in that interaction. One of my favorite examples of this is something that happens in every workplace. If you are talking about someone and not to someone, you are clearly not Challenging them Directly, and you’re not demonstrating Personal Care because you’re not really making any investment in that person or that relationship, you’re doing little to help them improve, etc. This can easily be considered Aggressive behavior and some might argue a bit on the Obnoxious side, too. Obnoxious Aggression, right? 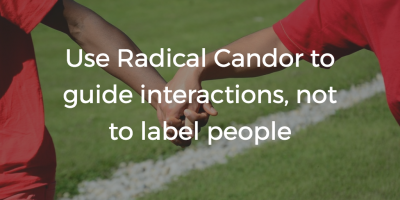 No – by Radical Candor standards (Radical Candards? ), you are behaving with textbook Manipulative Insincerity. And this proves my point that the more meaningful way to look at the interaction is through the lens of the axes, not the quadrant names. As with many things in Radical Candor, it can be useful to turn things inward first, before trying to apply the ideas to a co-worker. Thinking about the example above, almost no one thinks of themselves as Manipulatively Insincere. I know this because I teach people how to run our workshops and as part of the process, they have to come up with a story of a time in which they were Manipulatively Insincere, and this story is always an absolute struggle for people. “I’m just not that kind of person, Russ.” Yet, whenever we make the decision – conscious or unconscious – to talk about someone and not to someone, we’re operating with textbook Manipulative Insincerity. Many of you reading have done this and many of you reading would not consider yourselves Manipulatively Insincere, right? We wouldn’t either, because these are labels for interactions, not for people. Another example: Most people would not call themselves Obnoxiously Aggressive (high Challenge Directly, low Care Personally). I know this because in the workshops that I run, I usually ask! But, let me run down a scenario. Imagine you’re in the passing lane on the highway during rush hour traffic, and a dude in a nice sports car cuts you off, narrowly missing your vehicle with his. How do you react? Correct answers include: speed up and tailgate, give him the middle finger, yell obscenities at him. In all of these cases, there is a pretty clear Direct Challenge. And based on some of the horrible things we are willing to say about our fellow man when he cuts us off in traffic, it’s safe to say we’re really low on the Care Personally axis. In this interaction, we are acting Obnoxiously Aggressive toward our fellow citizens. So remember that we’re all susceptible. Just like you wouldn’t label yourself as Obnoxiously Aggressive based on one interaction, don’t jump to a label for another person either. Remember that how you intend to show up on a given day may not be how you actually show up that day. For example, imagine an interaction in which you are fresh off a big win and your co-worker is fresh off a big loss. Or what if your child kept you up last night? What if you are hungover? What if you had a great night sleep and got to the gym? Got breakfast? Got some bad news at home? Got some great news from home? And now ask these same questions, rhetorically, about this theoretical interaction with a co-worker. All of these variables can manifest and make what you think is a Radically Candid interaction feel much more like an Obnoxiously Aggressive one to the other person, and of course, vice versa. Remembering how these outside factors can affect you in a given interaction will help you be mindful that the other person is also influenced by variables that you aren’t aware of. Hopefully this will make you less likely to label their personality rather than the interaction. We hope these guidelines will help you remember to use the Radical Candor framework to guide your interactions, not to label people. Let us know what you think, and tell us what your challenges are! 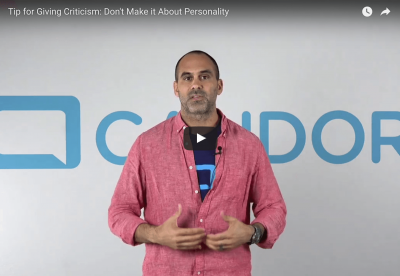 Radically Candid criticism is not about someone’s personality. When you give criticism, it is best to talk about how the work product could be improved, not about (alleged) flaws in the person’s character. Saying things like “You’re a jerk” or “You are sloppy” is neither kind nor helpful. And it’s almost always an imperfect analysis of the situation. So whenever possible, focus your feedback on the work. Now, this isn’t always possible, and Russ shares some tips for how to approach criticism when it’s about the person’s behavior, rather than the work product. Get more tips in our article on giving feedback that doesn’t focus on personality, and let us know if there are tricky feedback situations that we can help with! There is a big difference between Caring Personally and giving praise or criticism about somebody’s personality. The final tip in our HIP approach to feedback is that Radically Candid praise and criticism is not about personality. It’s about the work, not the person. People can’t alter their personality, so saying things like “You’re a jerk” or “You’re sloppy” is neither kind nor does it provide specifics to make the direct challenge clear. Saying “you’re a genius” when somebody does great work also has an unspoken, dangerous corollary: if the work is bad, “you’re a bloviating buffoon” (or maybe more commonly, “you’re a dummy”). The result of personalizing somebody’s work and calling them either a dummy or a genius is that they quit taking risks, quit learning, and quit growing. Saying that great feedback doesn’t personalize isn’t the same as saying that it isn’t personal. People care about their work, so they may react emotionally to criticism. 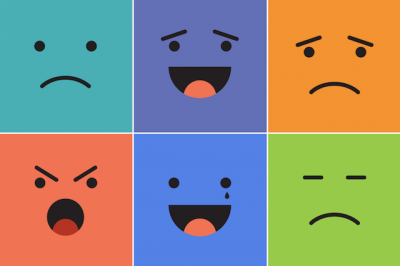 You can’t control another person’s emotions, but you can help make criticism easier by not personalizing. When you give feedback, it’s best to focus on the specifics of the work, not the person’s attributes. Personalizing feedback clouds both the other person’s thinking and your own. It clouds the other person’s thinking because if the problem actually is that the person is a dummy, then there’s nothing they can do about it. If that isn’t the problem, then they’re unjustly accused. Name-calling clouds your thinking because when you indulge in it, you are generally falling prey to the fundamental attribution error. This is the tendency for people to use personality attributes to explain someone else’s behavior rather than considering their own behavior or situational factors that were probably the real cause of the behavior. This makes personalized feedback a problem because it’s a) inaccurate and b) renders an otherwise solvable problem unsolvable. It’s usually easy to change one’s own behavior and situational factors, but almost impossible to change core personality attributes. When people screw up, it doesn’t mean they are morons. It just means they screwed up. Avoid the fundamental attribution error by focusing on specifics, not attributes. Instead of saying (or thinking) “What a moron,” be very clear about what went wrong. Try the Situation, Behavior, Impact and Left Hand Column techniques from our post about giving humble feedback. Focus on helping the person fix the problem by providing specifics they can act on, rather than criticizing personality traits that they can’t alter. A brilliant man I worked with, who was actually a really good guy, had a reputation for being a complete a-hole. He managed to turn it around by simply rephrasing something he said pretty often. He quit saying, “You’re wrong.” Somebody suggested he say instead, “I think you’re wrong.” That was better because it was humbler, but still didn’t solve the problem. When he started saying, “I think that is wrong,” people started to be more receptive to his criticism — paying him, in fact, to criticize them as an advisor. All too often an argument over something simple becomes a contest of egos and people start thinking (or saying behind others’ backs) phrases like “You’re a moron” or “You’re an arrogant jerk.” When an argument is about an issue, keep it about the issue. Personalizing unnecessarily will only make it harder to resolve the issue. When giving feedback, you should expect emotion. Even when you don’t personalize, it’s personal. That’s why you should eliminate the phrase, “Don’t take it personally” from your vocabulary. If I tell Bo there were ten typos in a presentation, and they left a bad impression in the client’s head and contributed to losing a deal, Bo is going to feel BAD, deep down. Bo is probably going to be SAD. Bo may have stayed up all night working on the presentation because it was a last-minute thing and feels MAD to have been put in a position where sloppy work was inevitable. Maybe I worked hard not to personalize the issue when I criticized Bo. Still, if I react to Bo’s emotional response by saying, “It’s not personal,” I’m just being insensitive. People pour themselves into their work, and when the work is not up to snuff, it sure feels personal. When we advise not to personalize issues, we mean, don’t say to Bo, “You are sloppy,” or even, “You did sloppy work.” But even if you depersonalize the feedback, and offer all the situation-behavior-impact specifics, and say, “when the client saw a presentation with so many little mistakes, they thought we didn’t really want the business,” you need to expect that Bo is going to have an emotional response. It’s futile to say in response to his emotional response, “Don’t take it personally!” Part of your job as a boss (and as a human being) is to deal with emotional responses, not to dismiss them or pretend they’re not there or avoid them. It’s easier to avoid personalizing feedback when you’re talking about a person’s work. But when you’re talking about something that is more personal, it’s even harder. One guy I worked with was less effective than he would otherwise have been because he just stood too close to people when talking to them. A woman I worked with had terrible body odor, so people didn’t want to work with her. Few things are more personal than personal space or body odor. Saying “you stink” would clearly have been personalizing. But how can you raise the issue? I tried hard to make the conversation about her colleagues’ noses, not her armpits, and I tried not to be prescriptive about the solution. Most deodorants contain aluminium which some studies associate with increased risk of cancer and alzheimer’s. I didn’t want her to feel she had to choose between effectiveness and disease. But I did have to let her know that if she chose to ignore the problem it would make her less effective at work. You have to find your own way to talk about these things, but describing the impact of the issue is a great way to avoid personalizing. 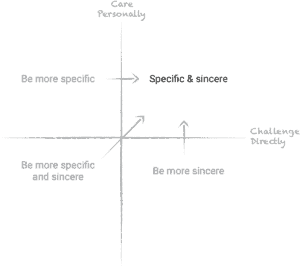 It can also help to go way up on the Care Personally axis and offer the feedback in a spirit of helpfulness. You can read more about this in Radical Candor. Pages 10-16, Chapter 2, and Chapter 6, especially pp 146-148 are especially relevant. Do you have tips about not personalizing feedback? Or stories about giving feedback on personal matters? We’d love to hear them! If you think you’ve given criticism that was Ruinously Empathetic, check out these tips for moving towards Radical Candor! Don’t try to spare people’s feelings by leaving out the details — that is not nice, it’s just unclear. If others have rated your criticism as Ruinously Empathetic, you’re not Challenging Directly enough. Try clearly explaining what you think directly to them. When you don’t say it, you rob the person of a chance to fix what’s wrong, or to push back and convince you that actually YOU are wrong. Not saying it is unclear and unhelpful. When you challenge somebody, you expect them to challenge you back. When you say, I think that’s wrong, you give them a chance to prove to you that it’s actually right. If somebody disagrees with your criticism, it’s a good thing, not a bad thing. Just say it right away. The longer you wait, the less clear you are because you remember fewer details about what actually happened. Don’t hide behind email or chat to avoid negative emotions. If somebody gets upset and starts to cry, it’s hard but it’s not the end of the world. Neither of you is water-soluble. If the person yells, it won’t kill you; if the person gets defensive, the fact you’ve already proven that you care will help you get through. You would never criticize a person in public, and that’s a good thing. But you probably could do a little more disagreeing and debating in public. In fact, not telling somebody when they have spinach in their teeth is actually like saying: “You are not even capable of removing spinach from your teeth, so I won’t bother telling you it’s there.” When you are clear about something that is wrong, it is a gift, an act of kindness. 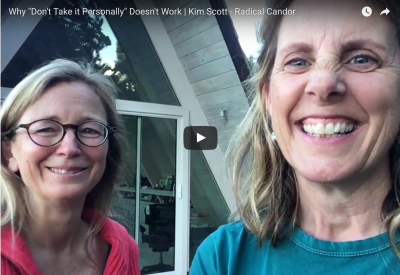 If you think you’ve given praise that was Manipulatively Insincere, check out these tips for moving towards Radical Candor! The more vague your praise is the less genuine it feels. If somebody has rated your praise as Manipulatively Insincere, you’re not showing you care or challenging them directly enough. Try saying “I like the way you ___” It’s hard to be non-specific after that opening. And when you’re precise about something you admire and why, your sincerity will shine through. If you try to sound sincere without the specifics, you’re likely to sound fake. Your praise is helpful because you’ve explained exactly what’s good and why; also, your sincerity shows through naturally. Offering praise that you don’t really mean will backfire. Try being more aware of the discrepancy between what you are saying and what you are thinking, and figuring out a productive way to say what you are really thinking. Offer praise right away and only when something has genuinely impressed you; don’t save it up and then use it just to soften the blow of criticism. If so, offer more specific details about what was good and why it matters, and your sincerity will show through naturally. Any discrepancies will come back to bite you! Telling somebody “you are a genius,” is problematic for the same reason saying “you are a moron” is: it personalizes. Besides, people see through it.